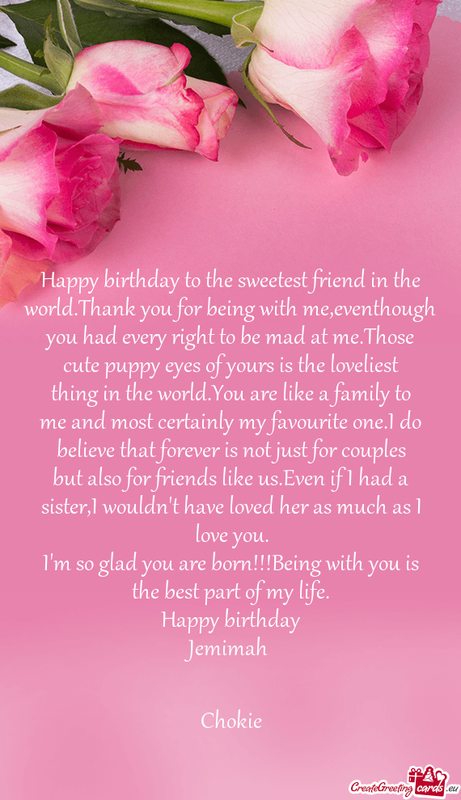 Happy birthday to the sweetest friend in the world.Thank you for being with me,eventhough you had every right to be mad at me.Those cute puppy eyes of yours is the loveliest thing in the world.You are like a family to me and most certainly my favourite one.I do believe that forever is not just for couples but also for friends like us.Even if I had a sister,I wouldn't have loved her as much as I love you. I'm so glad you are born!! !Being with you is the best part of my life.